Book Now! 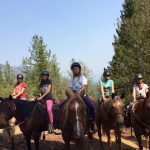 Ages 10+ Week-long Summer Horse Camps 2018! 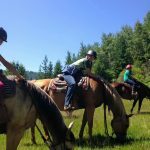 Ages 10+ week-long summer horse camps! •Waiver signed by a parent or legal guardian. •Appropriate clothing for riding ie long pants, shoes with a heel preferred, helmet (can be supplied). •Change of clothes for after ie shorts etc. Kids will be assigned their own horse for the week. 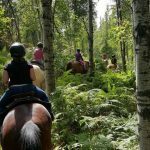 Kids will learn how to properly groom, saddle, hoof pick and care for their horse. We will be studying parts of the horse, hoof, saddle. We will also be extensively teaching horsemanship and safety around horses. 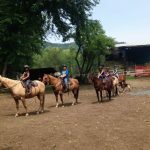 Kids will learn to ride and become quite confident over the week with western horsemanship. We will be doing obstacle courses and lots of trail riding!! This is a great way for kids to gain confidence and have a wonderful time in nature surrounded by a warm and friendly farm atmosphere. Make sure to book your reservations. First come first serve. We allow up to 6 kids per camp. Cost is $60/day so $300 for the week. $100 deposit to hold a spot. Please call 250 364-0333 to book or message us here on FB.